I love reading other hearing loss blogs. It helps me feel connected to the hearing loss community and to feel less alone with my own hearing loss. I hope reading my blog helps you feel that way. One of my favorite hearing loss blogs is The Better Hearing Consumer written by Gael Hannan. You can see my guest post on her blog here. So when I saw she had a new book published, I couldn’t wait to read it. I was not disappointed. In The Way I Hear It, Gael shares her unique perspective on the realities of leading a life with hearing loss. She combines humor, helpful tips and suggestions, and real emotion. You will both laugh and cry with Gael as you read various parts of the book. Many sections take inspiration from her various blog posts, but there is also much that is new. My favorite parts of the book dealt with Gael’s relationships with her husband and son. I too have a husband who hears well and two children who hear well (so far), so I could relate to her frustrations, worries, and labors of love. I found the suggestions shared by her son to be particularly truthful, heartwarming and helpful. I want to share his words with my own children. Her Heareflections poetry are also quite inspired. You can feel her angst, anger, and acceptance as she asks for her hearing back and shares the happiness she finds from communicating with her loved ones in ways more intimate than words. Gael also offers many useful tips on how to work better with your hearing care provider, how to travel with hearing loss, and the best ways to navigate the confusion of hearing loss technology. She even provides suggestions for better communication with someone with hearing loss from both the hearing and non-hearing persons’ perspectives. But mostly the book is very uplifting. Gael’s joy for life comes through on every page. Despite the challenges of hearing loss, she has many wonderful friends (both hearing and not), a happy family life, a zest for trying new experiences, and a calling — to help others with hearing loss sit better with their own struggles. 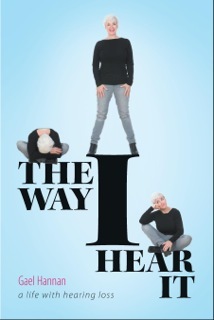 Readers, what books about hearing loss do you recommend? You can also find Living With Hearing Loss on Facebook and Twitter. THANKS for the reference, Shari. Again let me say how good it is to (after all these years) discovering resources for the hearing impaired. I think it is due to my avoidance of the “joining” syndrome. I simply don’t enjoy group activity as I used to and that ties directly into my inability to hear. But I still enjoy reading and writing. Thanks. Thank you for reviewing this wonderful book. I purchased it fron iTunes and began reading it immediately. Even after 45+ years of living working and dealing with progressive hearing loss, trying to remain positivè and not fall into the trap of self pity, I find life hard at times. My greatest hope is that my family and close friends will read Gael’s book and better understand my daily battle to hear and be heard. Hearing loss is a burden and as a HoH person I feel like I am a burden to others, humour has helped me manage but sometimes the well runs dry. Thank you Gael for sharing your life with us it does indeed help to know we are not alone. I’m going to go out and buy this book now. I’m only just starting to connect with my hearing loss as it went from one-sided to dual severe sensorineural (did I even say that correctly?) and now have to rely on assistive devices. I read the book “El Deafo” by Cece Bell and found that I felt less alone and more understood. Since then I’ve been looking for more books and blogs (hence finding your blog) to feel more understood and connected. Thanks for writing about your experiences and sharing this book recommendation. Glad the books and blogs are helping. They really help me feel more connected and understood too. Enjoy the book!